Johann Jakob Bachofen (December 22, 1815 – November 25, 1887) was a Swiss anthropologist and sociologist, famous for his theory of matriarchy and his work on the role of women in ancient societies. His work brought attention to the religious veneration of goddesses such as Aphrodite and Demeter, prominent in ancient cultures. His suggestion that cultures evolved from early societies dominated by female goddesses and earthly women was novel and exciting. While his work stimulated much research and writing, the data did not bear out his theories. Nevertheless, at a time when patriarchal societies dominated, the need to bring out the feminine aspect of God and human beings was real. 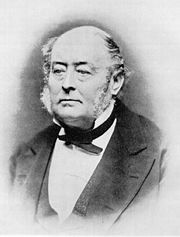 Johann Jakob Bachofen was born on December 22, 1815 in Basel, Switzerland, first son of a wealthy merchant family. His father had a ribbon factory and was a descendant from a long line of merchants. His mother’s family were prominent politicians and scholars. After finishing high school with honors, Bachofen went on to study law and sciences in the universities of Berlin and Gottingen. Already in 1838, at the age of 23, he finished his doctoral studies. After that, he went to the University of Paris and Cambridge, England for two additional years of study. He was made professor of the history of Roman law at the University of Basel in 1841, serving in that position until 1845. At the same time, he was working as a judge at the Basel criminal court (1842–66). In 1845, he resigned his professorial position after being accused of obtaining this position solely due to his higher social standing. He remained working as a judge for the next 20 years, but completely withdrew from public life. It was in these years that he began studying history. He was particularly interested in the nature and proper method of the study of history, a topic that would occupy his thoughts until the end of his life. Bachofen liked solitude and never had many friends. He remained single until he was 50 years old, living in his parent’s house. In 1865, he met the beautiful Louise Elisabeth Burckhardt, 30 years his junior, whom he married the same year. Their only son was born in 1866. Bachofen started to focus his career on research in the 1860s. He undertook several long journeys to Italy, France, Spain, and Greece, where he studied ancient civilizations. His masterwork Das Mutterrecht was published in 1861, but it went mostly unnoticed. Bachofen continued to do research until his death. He died on November 25, 1887. Bachofen was interested in the development of social organizations. He analyzed myths and archaeological artifacts in order to reconstruct the social landscape of the ancient world. He argued that human thought has evolved from symbolic to mystical, and finally to the logical form of today’s society. He was also able to show that in different societies marriage and family took different forms, and that societies developed from matriarchal, in early societies, toward predominantly patriarchal, in Bachofen's time. In 1861, Bachofen published his seminal work, Das Mutterrecht or Mother Right: An Investigation of the Religious and Juridical Character of Matriarchy in the Ancient World. He presented a radically new view of the role of women in a broad range of ancient societies. Bachofen assembled documentation to demonstrate that motherhood was the keystone of human society, religion, morality, and decorum drawing upon societies in Lycia, Crete, Greece, Egypt, India, Central Asia, North Africa, and Spain. He concluded the work by connecting archaic "mother right" with the Christian veneration of the Virgin Mary. A selection of Bachofen's writings was translated as Myth, Religion and Mother Right (1967). Hetairism: A wild nomadic "tellurian" phase, characterized as communistic and polygamous, whose dominant deity he believed to have been an earthy proto Aphrodite. Das Mutterrecht: A matriarchal "lunar" phase based on agriculture, characterized by the emergence of chthonic "Mystery Cults" and law, whose dominant deity was an early Demeter. The Dionysian: A transitional phase when earlier traditions were masculinized as patriarchy began to emerge, whose dominant deity was the original Dionysos. The Apollonian: The patriarchal "solar" phase, in which all trace of the matriarchal and Dionysian past was eradicated and modern civilization emerged. Bachofen's model was based on an imaginative interpretation of the existing archaeological evidence of his time, and tells us as much about Bachofen's own time as it does the past. Bachofen applied evolutionary theories to the development of culture in a manner that is no longer considered valid, and modern archaeology and literary analysis have invalidated many details of his historical conclusions. Nevertheless, the origins of all modern studies of the role of women in classical antiquity are found in Bachofen, criticizing his model and developing new understandings based on correcting it. There was one contemporary of Bachofen who supported his work. Alexis Giraud-Teulon, an anthropologist from Geneva, was a great admirer of his ideas on the importance of matriarchies in ancient societies. They corresponded by letter, and Giraud-Teulon developed his own version of Bachofen's theory which regarded the matriarchal phase not as a general stage of societal development but as a special appearance which can be traced only to certain pre-Indo-European cultures. He published his theory as La Mère chez certains peuples de l'Antiquité ("The Mother among certain peoples of antiquity) (Giraud-Teulon, 1867). Although there was little initial reaction to Bachofen’s theory of cultural evolution, largely because of his impenetrable literary style, by the beginning of the twentieth century the public became aware of its importance. His work eventually inspired several generations of ethnologists, social philosophers, and writers: Lewis Henry Morgan, Friedrich Engels (who drew on Bachofen for Origins of the Family, Private Property, and the State,) Thomas Mann, Jane Ellen Harrison (who was inspired by Bachofen to devote her career to mythology) Erich Fromm, Robert Graves, Rainer Maria Rilke, Joseph Campbell, Otto Gross, and Julius Evola. Thus, Bachofen's work can be understood as an important precursor of twentieth century theories of matriarchy that still echo today, such as the Old European culture postulated by Marija Gimbutas, and the field of feminist theology and "Matriarchal Studies" in feminism. Valdez, Damian. 2009. Bachofen’s Rome and the Fate of the Feminine Orient. Journal of the History of Ideas 70(3): 421-443. Frederick Engels - Origins of the Family, Private Property, and the State - Engels gives Bachofen a Marxist spin on Origins of the Family. Johann Jakobs Bachofens – Biography. History of "Johann Jakob Bachofen"
This page was last modified on 11 May 2018, at 16:27.